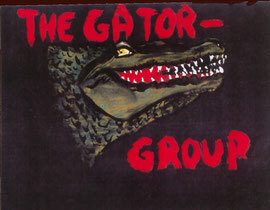 Gator Group - unhappyends Jimdo-Page! In 1987 Vonny and I spent two months in Hollywood. Before we did live and work a year in Orlando, Florida, working for the Walt Disney Company at EPCOT Center. We had an apartment in that little village, Lake Buena Vista, a couple of minutes away from Disney Village and WDW. I did learn a lot about the Entertainment Business there and I was very impressed by Walt Disney´s work and how he did built up his wonderful company. 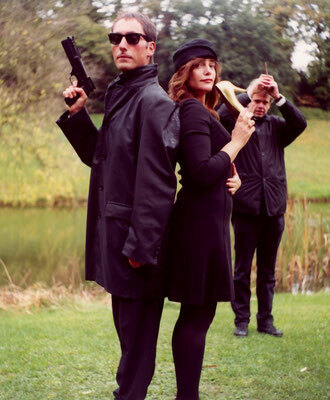 a comedy-thriller Charade-stayle at least in the original English language version. Would have cost millions to make. and was surprised how long it took inspite of the fact I formely worked for German networks. morning till midnight and then wondering why it´s not going to work. instead of shooting all around the clock. Now we usually come to the set around 9 or 10 o´clock in the morning, start shooting around 11, have lunch at 1 or 2 p.m. and then shoot - with one or two other breaks till 6 or if necessary 8 p.m.
of minutes from EPCOT Center. When you live and work in Florida, USA one animal is always around: the local alligator. set up a mulitmillion dollar conglomerate. Mr. Al Gator, shown above. 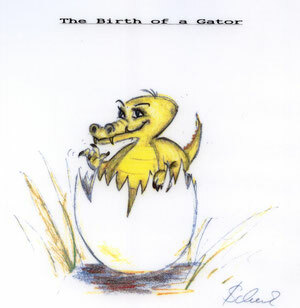 brechen" one day made me a wonderful gift: The drawing of the Gator logo (below).